One thing I’ve never done in my nine years as a resident of Edinburgh has been to take a guided tour of the grand old place. That’s because these tours are usually led by irritatingly boisterous am-dram types dressed badly in jester/wench costumes. 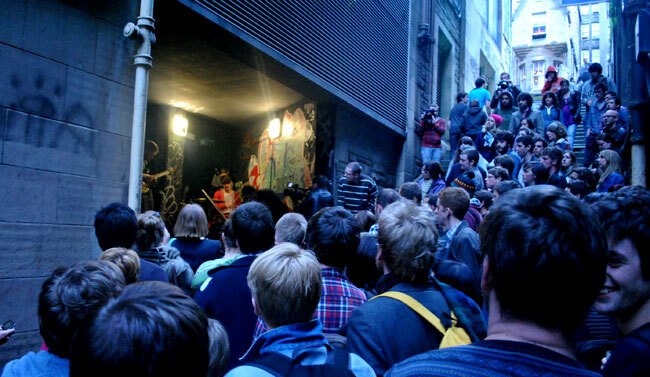 But I broke my duck on this front at the weekend, when I joined about 50-100 other music fans on Detour‘s Wee Jaunt. And there wasn’t a codpiece in sight. The whole idea is that it’s a secret line-up, and so there was a level of uncertainty, nay, trepidation, beforehand. But it doesn’t take long to be swept along on the upbeat atmosphere – and that was without a drop of alcohol. I saw some great mini-gigs – especially Conquering Animal Sound and Lady North – in some unlikely locations, and you can read my full review on Radar. Ally McCrae and David Weaver carry off their Detour exploits with the kind of carefree tomfoolery that makes it all seem effortless. Staging an event like this is anything but. Here are a few more of my photos from the day. Posted in Music, Photography. Tagged Detour, Edinburgh, Wee Jaunt.